A gentle way to share a pleasurable experience. It is just as much a way of life as it is a technical sensation, and yet it takes up just a few square metres of space in your home. Invite your friends and family to a Soft Sauna experience, select a therapeutic essential oil, feel the warmth and gentle steam from the heater engulf you, and enjoy being together – let Soft Sauna make an impression on your day. Soft Sauna picks up where traditional saunas leave oﬀ. Some people prefer a hot and quick sauna, others like to linger in mild temperatures enjoying the gentle steam and aromatic fragrance. 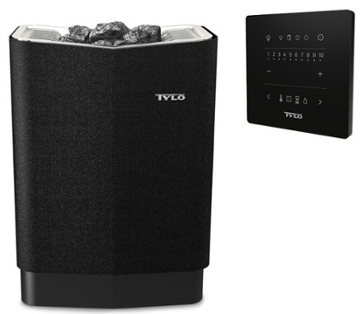 Test for yourself which temperatures and options are ideal for you and your relaxing moment. ENJOY SOFTER WARMTH, YOUR WAY. Designing your dream sauna or steam room couldn’t be any easier with our professional support. Download our step by step guide to facilitate the planning of your dream sauna or steam room. Once you’ve finished, simply email the document to us and we will provide you with a price for your review. receive our exclusive offers and latest news. 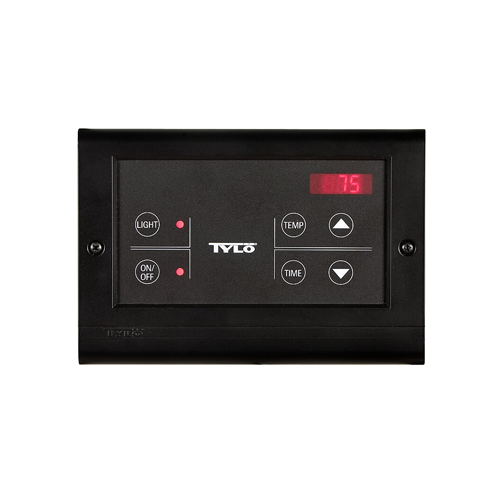 Electronic control panel, equipped with touch-control that not only displays the temperature and running time, but can also be programmed to start up to 24 hours in advance and run for between 1 and 12 hours for sauna. The control panel allows you to regulate lighting in the steam bath, set the maximum temperature, switch between Fahrenheit and Celsius, use a 12-hour or 24-hour format, set different languages, and more advanced settings and test options. Developed for seamless operation with control panels Elite or Pure and sauna heaters up to 20 kW. Compatible with our Sense Commercial and Expression sauna heaters and enables upgrading of older SD/SDK electric sauna heaters. 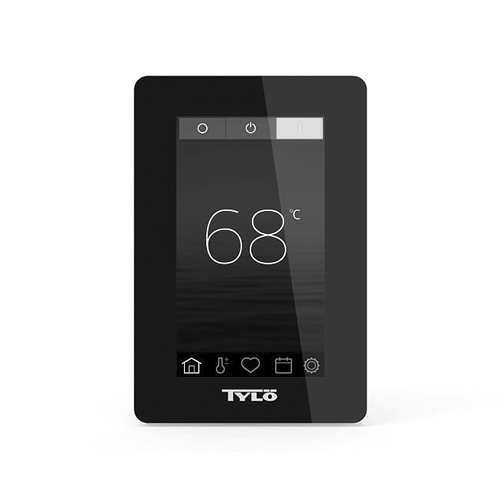 The Tylo Thermostat (TS 30-012) Control Panel is for SDK 10 and SD 16 heaters. For wall installation outside the sauna room (maximum distance 1.8m). Timer for up to 12 hours running time. Switchable to run between 1 and 24 hours or weekly programming and has a display that indicates temperature, remaining operating time, day and time. 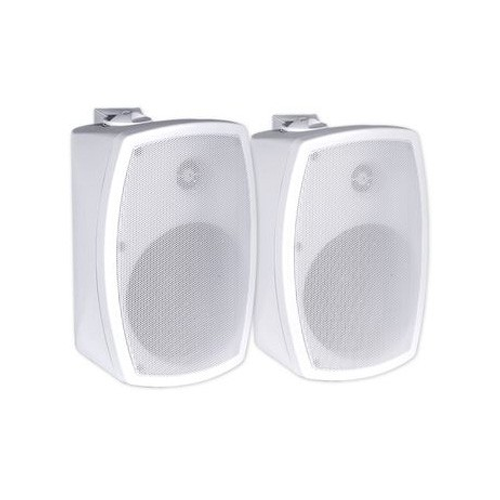 In addition the CC 300 is equipped with a switch for lighting, English instructions, and memory, security code and energy-saving stand-by functions. The control can also be controlled from external units. Thanks to the integral weekly timer, the CC 300 also offers optional automatic on/ off operation and stand-by mode at preselected times on the days of your choice. The control panel can be operated from an external control point. Display for time and temperature, switch for lighting, and security code function. Programmable for 1, 3, 12 and 24 hours or continuous operation. 0–10 hour preset. Size: 5 1/8” x 7 1/2”, depth 1”. 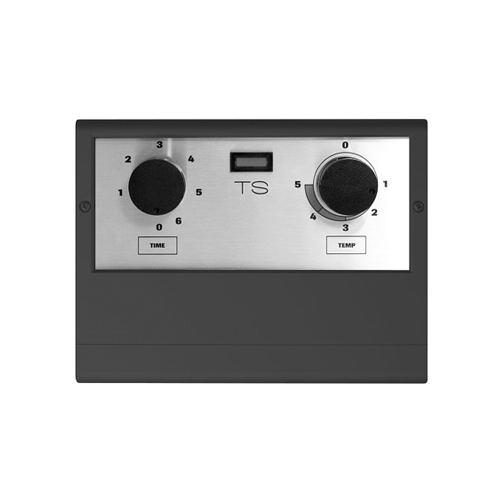 Compatible with Deluxe heaters together with a relay box. 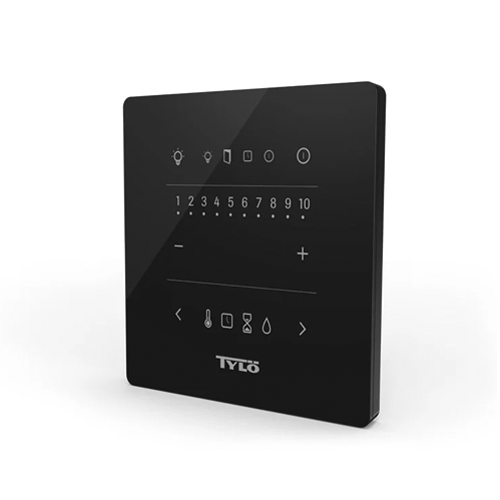 The multi-disciplinary control panel from Tylö for saunas or steam rooms is packed with advanced features, thanks to its internal processor and operating system. It includes energy saving functions and WiFi/App connectivity and is compatible with Steam Home and Steam Commercial steam generators as well as Sense Elite, Sense Combi Elite, Expression and Sense Commercial. Download WellAccess™ app in App-store and Google-Play or use Program for PC. 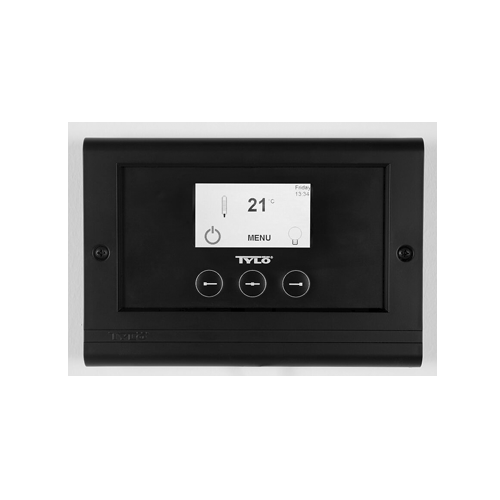 Set and monitor your sauna or steam room with the Pure thermostat control panel. 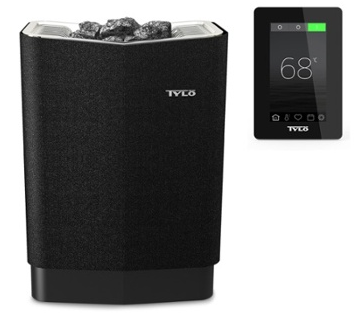 The thin black control lights up and lets you set the lighting, temperature and sauna time easily with only a few touches. May be placed inside or outside the space. Compatible with Steam Home steam generator and Sense Pure, Sense Combi pure, Expression and Sense Commercial electric sauna heaters. Little details can make a big diﬀerence. A few well chosen products from the Tylö range of accessories will soon give your public sauna room a distinctive character all of its own. 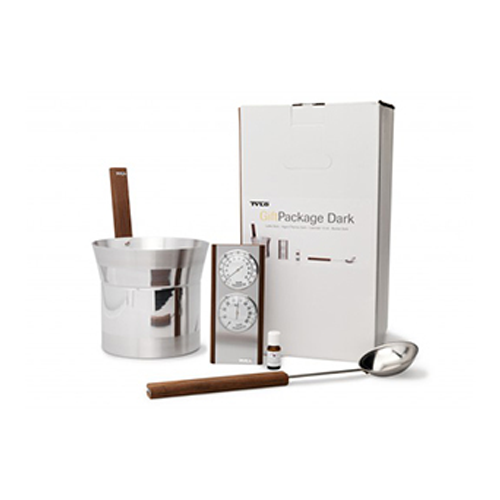 The PRO accessories are made of stainless steel and aspen. 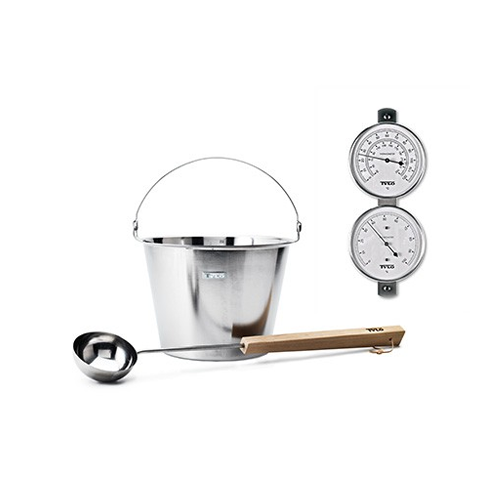 Choose between bucket, ladle and hygrometer/thermometer. Tylö has developed a brand new steam distributor, specially tailored for Sense Commercial 10-20 sauna heaters, to improve the distribution of steam in Tylö’s Tylarium for the professional market. As well as spreading the steam more eﬀectively in the sauna room, Tylö’s new steam distributor helps reduce the noise level, which is an important aspect in the overall experience of wellness. Dilute with water. 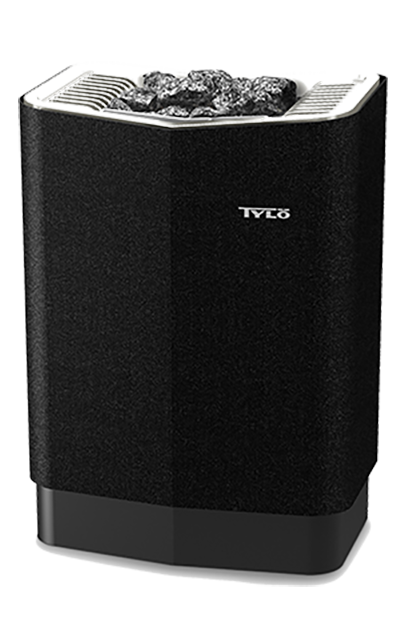 For use with our earlier Tylö fragrance dispenser models, Sauna Fresh and Steam Fresh. 250 ml plastic bottle. Natural stones of igneous dolerite rock (black diabase) that withstand rapid heating and cooling. One carton (approx. 14 kg) is suﬀcient for our Expression heaters. Sense Commercial 10-20 heaters requires two cartons. 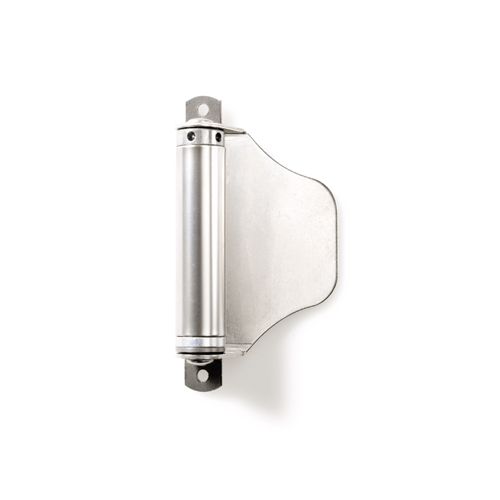 Fits to the side of the door with the hinges, to close the door from a fully open position. For gentle, controlled closure. Steam and heat-resistant design, suitable for recessed installation under the lower bench in the sauna. 50 W output. Installation size: Ø 117 mm, depth 60 mm. Supplied in pairs. The given alternative for the utmost sauna pleasures. Dry sauna, wet sauna, rich and warm steam. You name it, Sense Combi Elite sauna heater delivers, while being efficient, smart and easy to use. 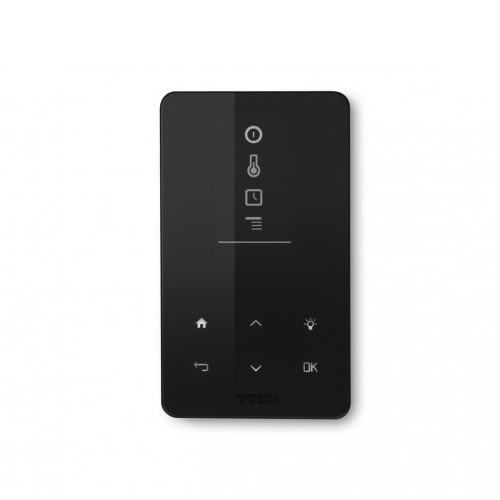 With its Wifi control panel, you may even program it or turn it on or off from your couch or from the pool. 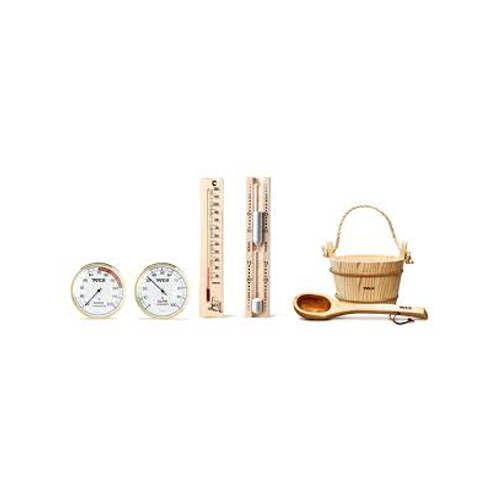 Sense combi elite 6,6 kW – for sauna size 4-8 m3. Sense combi elite 8,0 kW – for sauna size 6-12 m3. 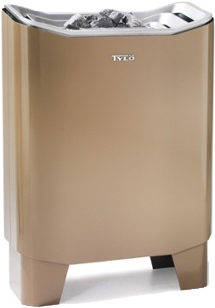 Sense combi elite 10,5 kW – for sauna size 10-18 m3. Our newest addition to the Sense range of sauna heaters. It is fitted with a number of smart and patented features and makes a perfect choice for energy efficient sauna bathing. Elite control panel with Wifi connectivity for maximum advantage and comfort is included. Sense Elite 6,6 kW – for sauna size 4-8 m3. Sense Elite 8,0 kW – for sauna size 6-12 m3. Sense Elite 10,5 kW – for sauna size 10-18 m3. Like the rest of the Sense family of electric sauna heaters, Pure delivers heat fast and efficiently. 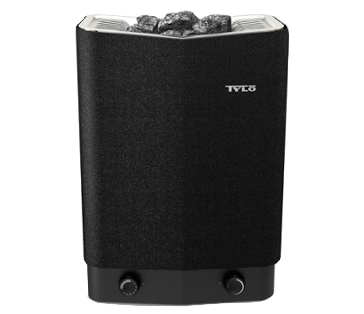 It is standard equipped with digital touch control panel Pure for ease of use and convenience. 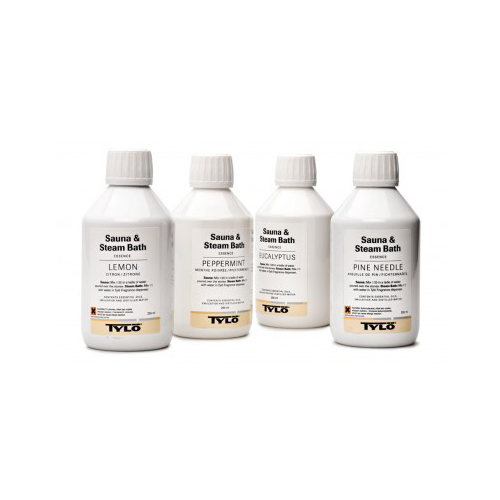 Sense pure 6,6 kW – for sauna size 4-8 m3. Sense pure 8,0 kW – for sauna size 6-12 m3. 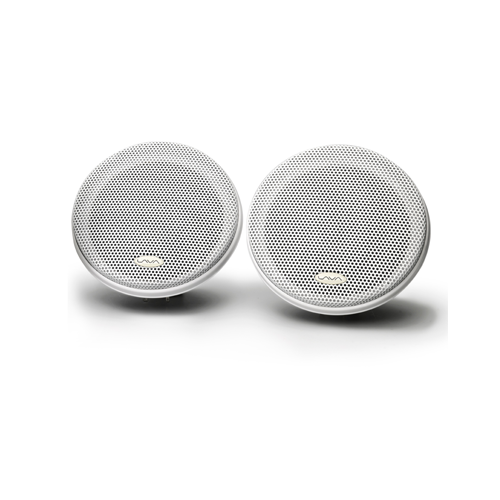 Sense pure 10,5 kW – for sauna size 10-18 m3. Expression electric sauna heater’s good look is not by accident. 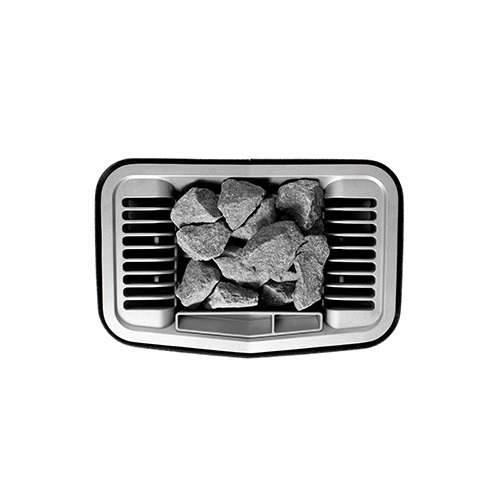 This award winning design will heat your sauna fast and with ease. 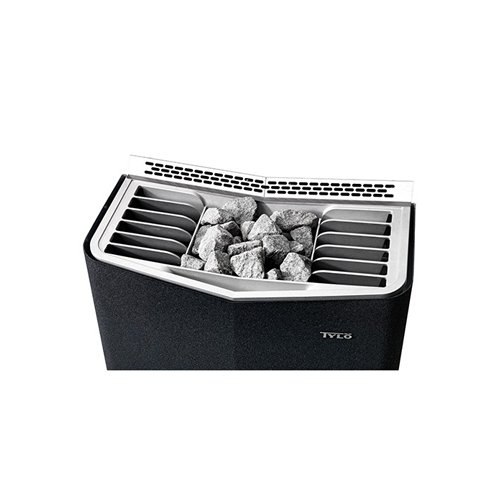 It’s built in air chambers speeds up air and heat distribution and contributes to its energy efficiency. Available in several different colors. 10 kW – for sauna size 10-18 m3. The Sense Sport electric sauna heater is available in versions with two different power outputs and may be placed on the floor or on the wall. The control panel is built into the heater and located at its base. 6,6 kW – for sauna size 4-8 m3. 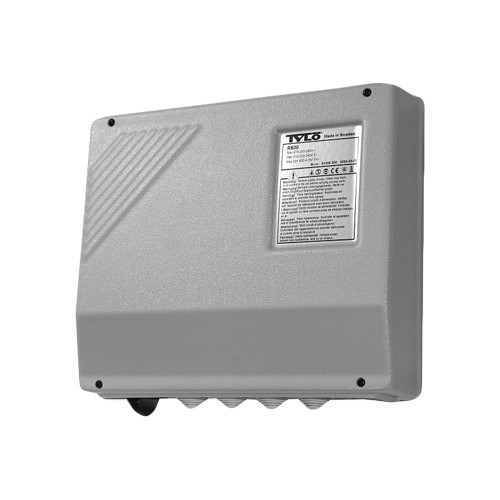 8,0 kW – for sauna size 6-12 m3. 6.6 kW – for sauna volume 4-8 m3. 8 kW – for sauna volume 6-12 m3. Offers a classic dry sauna. Choose either control panel Elite or Pure to your Sense heater. The control panel is included in the price.